How long does it take to receive the furniture? Click here to send us an email. We' respond within a few hours at the most. Jump on with us right now at the bottom of your screen & we'll help you on the spot! Scroll down to see all Customer Order Photos, or select a Collection below to narrow your search! 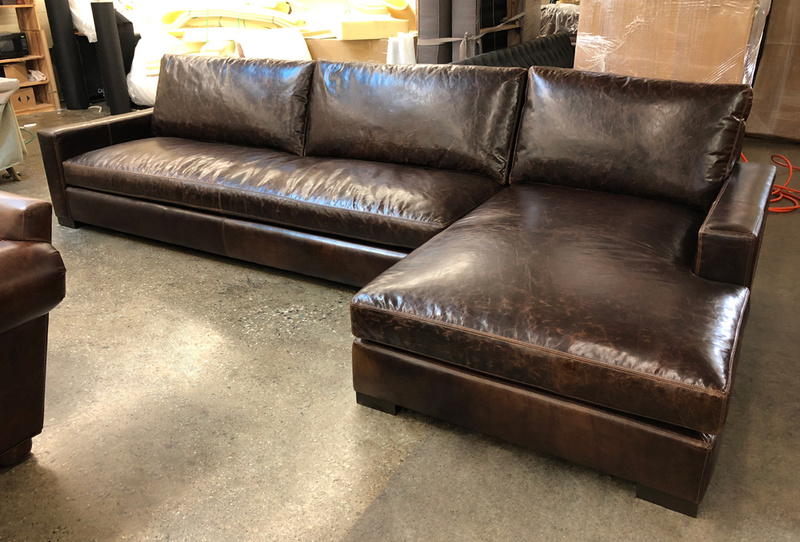 This pair of Langston Sofas in Italian Brompton Cocoa Leather made their way to Williamsville, New York recently. 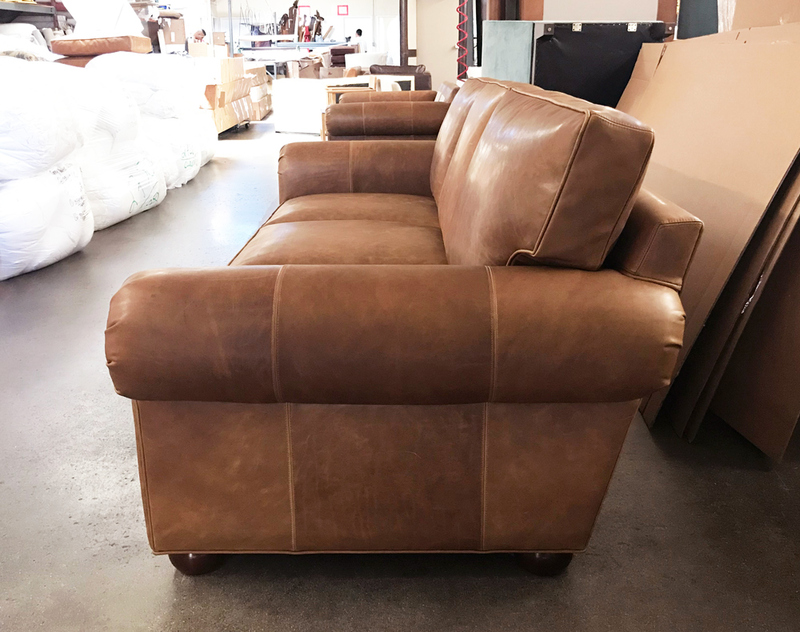 Brompton leathers are Full Grain European hides with natural scars and markings which distress beautifully and develop patina, deep colors and shading variation with loads of character. Read More about our Langston Collection here! 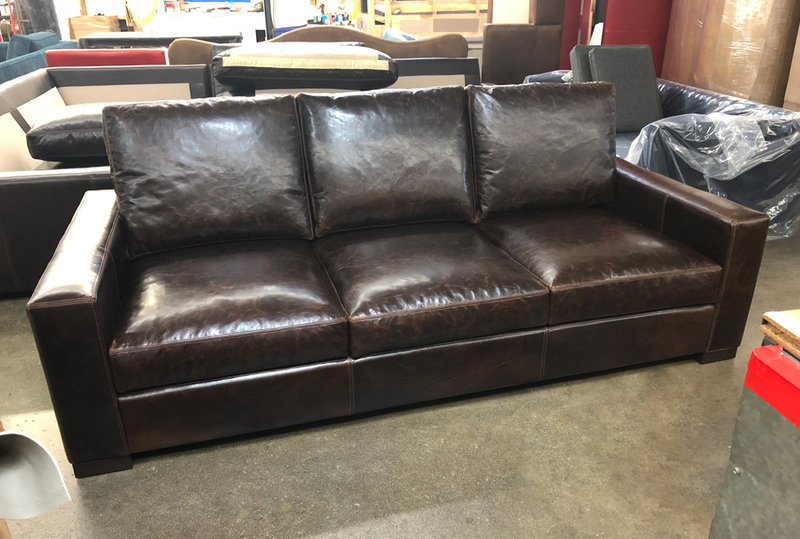 This entry was posted in Custom Leather Order Feed, Langston and tagged 48" Deep, Brompton, Brompton Cocoa, custom, full aniline, full grain leather, langston collection, langston leather sofa, restoration hardware on February 22, 2019 by LeatherGroups. 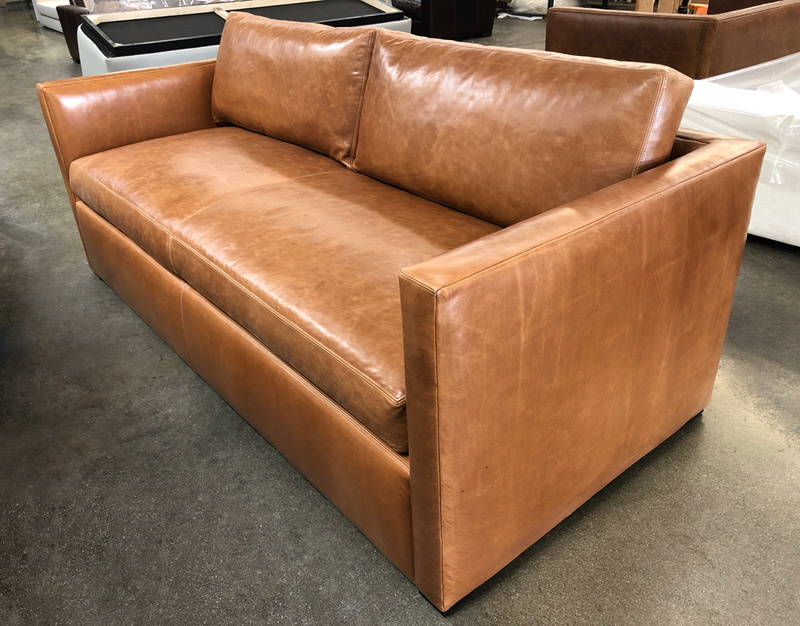 This Bench Cushion Oscar Sofa in Italian Glove Chestnut is a perfect combination of the classic, vintage, soft leather look and feel with a twist of modern design. Delivered recently to a customer in Long Beach, New York it’ll be treasured for a life-time and a cozy addition to their family room! Our Glove Leathers are Full Grain European hides Tanned in Italy with natural scars and markings which distress beautifully and develop a gorgeous patina with deep colors, shades and loads of character. 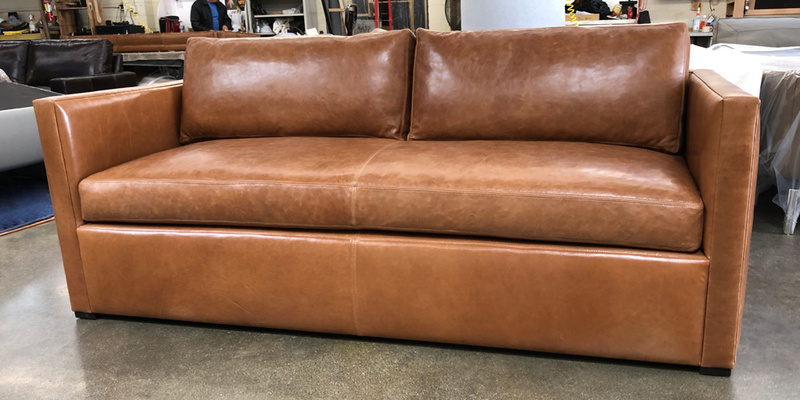 This entry was posted in Custom Leather Order Feed, Oscar and tagged 39" Deep, Bench Cushion, Glove Chestnut, Italian Glove Chestnut, Italian Glove Leather, Oscar Leather Collection, Oscar Leather Sofa on February 22, 2019 by LeatherGroups. 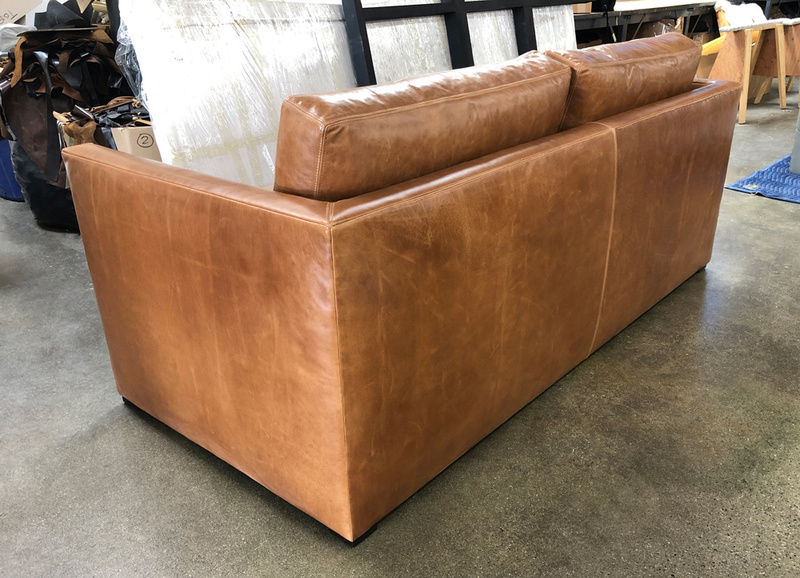 This Julien Track Arm Leather sofa with a Bench Cushion was recently shipped to a customer of our in Raleigh, North Carolina. Italian Berkshire Chestnut is a Full Grain Leather made from European hides with celebrated natural scars and markings. 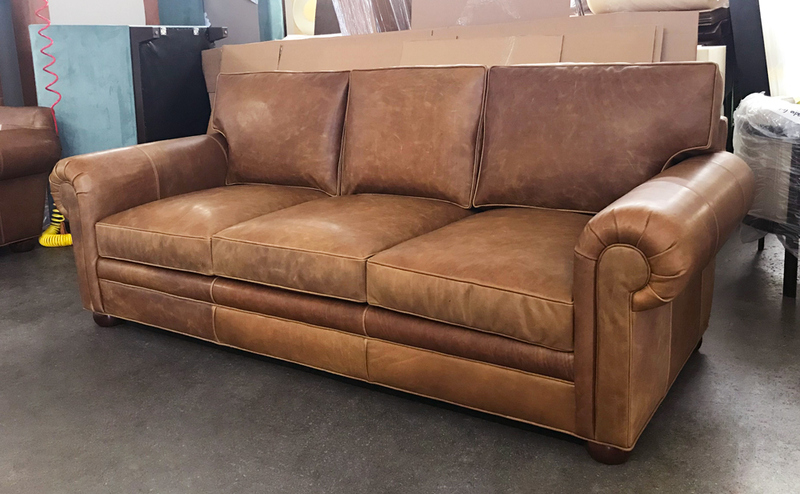 Tanned and finished in Italy with Oil and Soft Waxes, our Berkshire leathers are slightly polished and milled for an authentic, vintage look. Read More about our Julien Collection here! 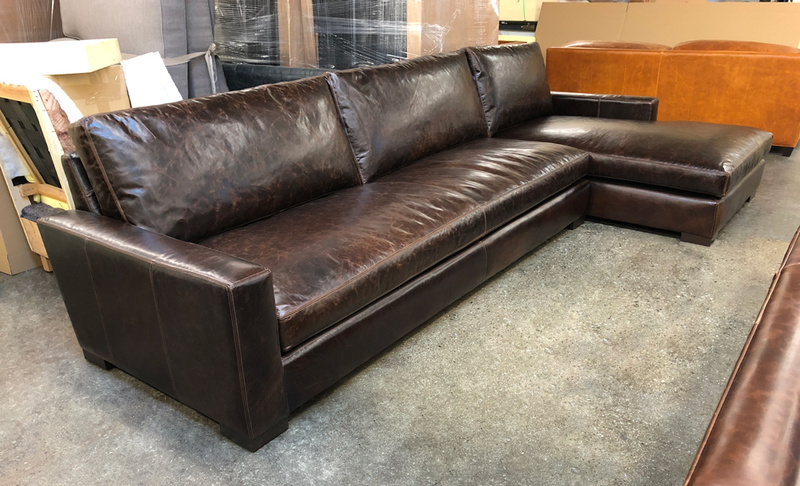 This entry was posted in Custom Leather Order Feed, Julien and tagged Bench Cushion, berkshire, Berkshire Chestnut, full grain leather, Italian Berkshire Chestnut, Italian leather, Julien Leather Collection, Julien Leather Sofa, lancaster leather collection, restoration hardware on February 21, 2019 by LeatherGroups. 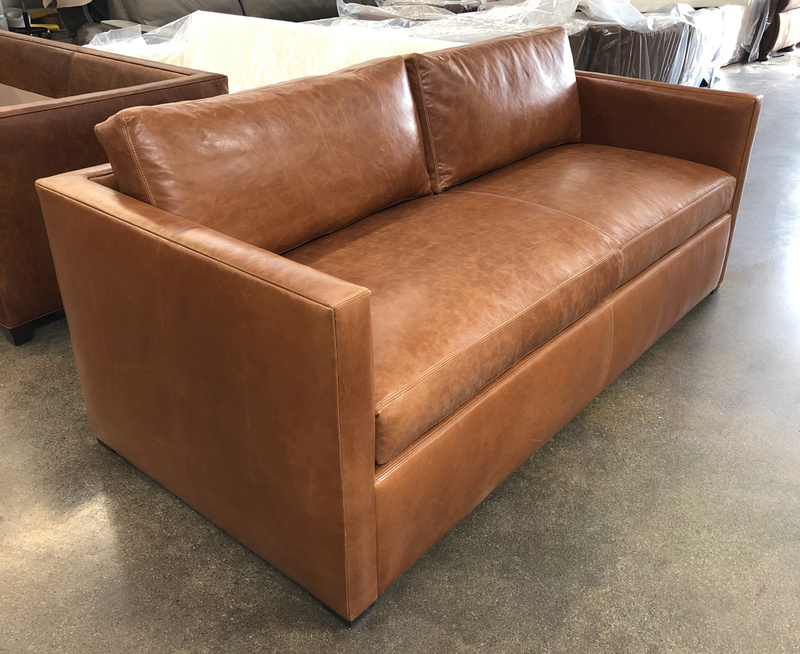 This custom Braxton Sofa Chaise in Italian Brompton Cocoa was delivered recently to a customer in Kansas City, Kansas. This customer requested that we place the chaise on the left side so it fits perfectly in their living space – Beautiful! Brompton leathers are made with Full Grain European hides with natural scars and markings which distresses beautifully and develops patina, deep colors and shades with loads of character. 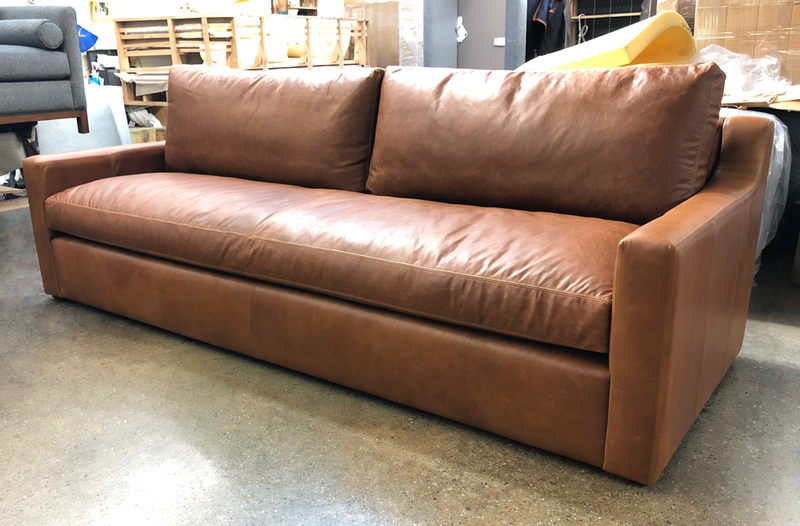 This entry was posted in Braxton, Custom Leather Order Feed and tagged 43" Deep, Bench Cushion, braxton collection, braxton leather sectional, braxton sectional, braxton sofa chaise sectional, Brompton Cocoa, custom length, full aniline, full grain leather, Italian Brompton Cocoa, Italian Brompton Leather, No Ears on February 20, 2019 by LeatherGroups. 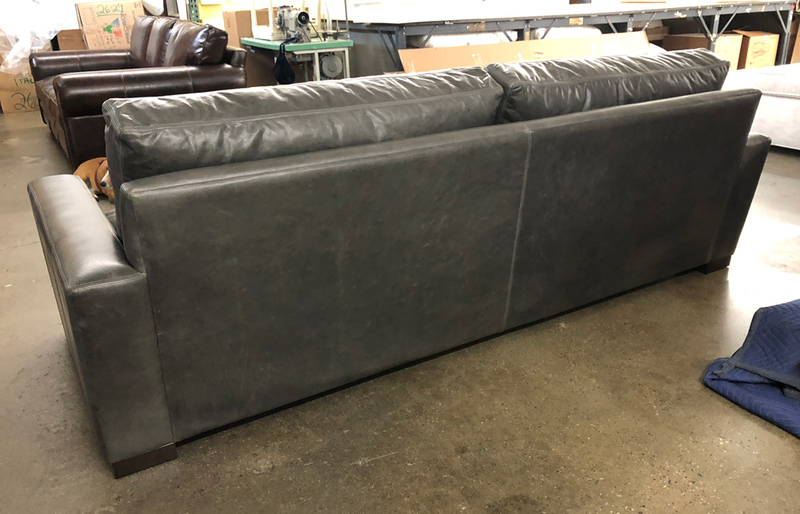 This Braxton Twin Cushion in Berkshire Pewter Italian Leather headed to Portland, Oregon recently. Berkshire Leather is a cousin of our popular Brompton Leather, just without the extra wax impregnation that gives Brompton it’s shine. Berkshire could be thought of as a matter version of Brompton, made from the same European hides at the same Italian tannery. These leathers are finished with Oil and Soft Waxes, then slightly polished and milled for an authentic vintage leather look. 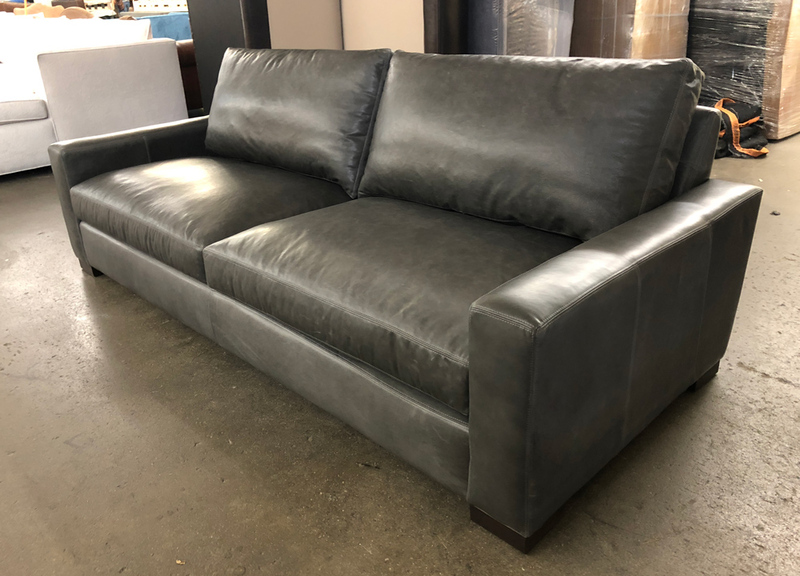 This entry was posted in Braxton, Custom Leather Order Feed and tagged 43" Deep, 8 way hand tied coils, Berkshire Pewter, braxton collection, braxton leather sofa, custom, full aniline, full grain leather, Italian Berkshire Leather, italian Berkshire Pewter, No Ears, restoration hardware, square arms on February 19, 2019 by LeatherGroups. 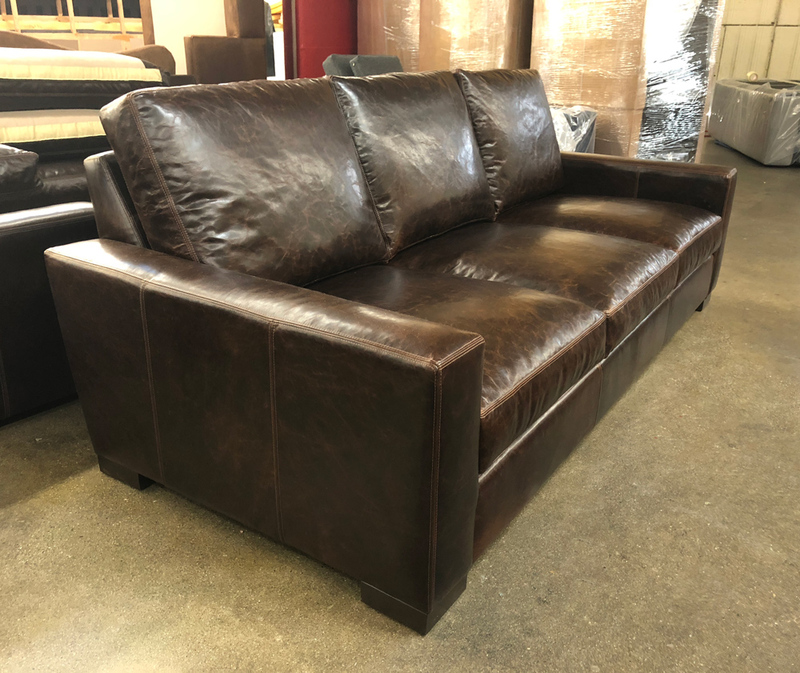 This beautiful Braxton Italian Leather Sofa in Brompton Cocoa was recently delivered to a customer in Cincinnati, Ohio. 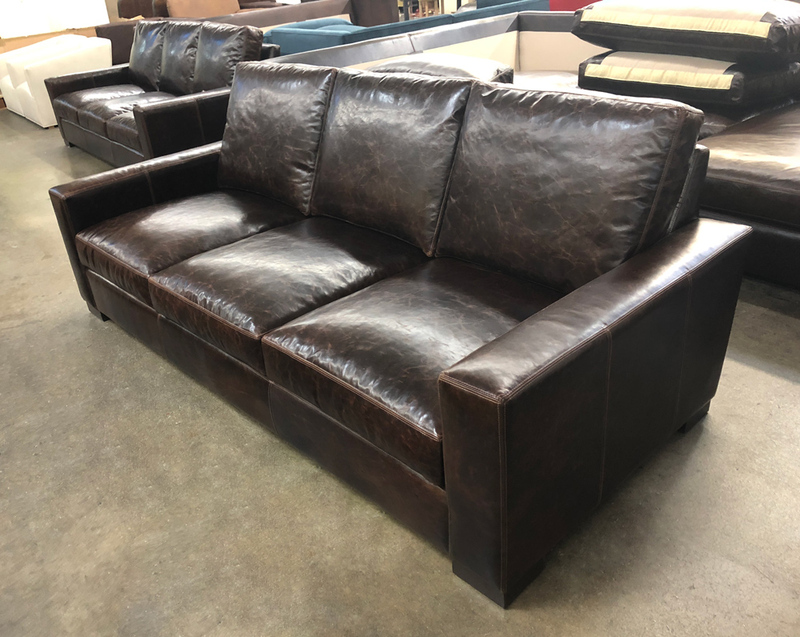 Brompton Cocoa is a Full Grain, Full Aniline Leather made from European hides with celebrated natural scars and markings. 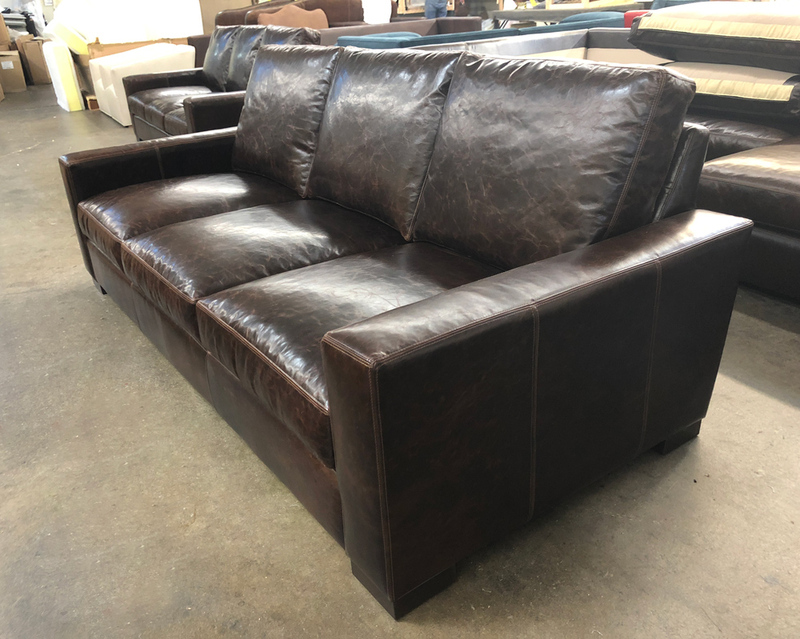 It’s been a top leather with us for years and as it distresses over time it develops a rich patina with a ton of character. Read more about our Braxton Collection! 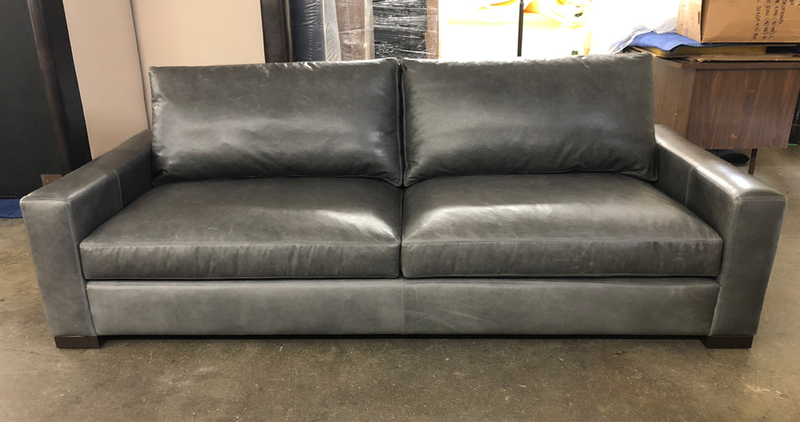 This entry was posted in Braxton, Custom Leather Order Feed and tagged 43" Deep, 8 way hand tied coils, braxton, braxton collection, braxton leather sofa, braxton sectional, Brompton Cocoa, brompton cocoa mocha, Italian Brompton Cocoa, Italian Brompton Leather, leather, No Ears on February 19, 2019 by LeatherGroups. 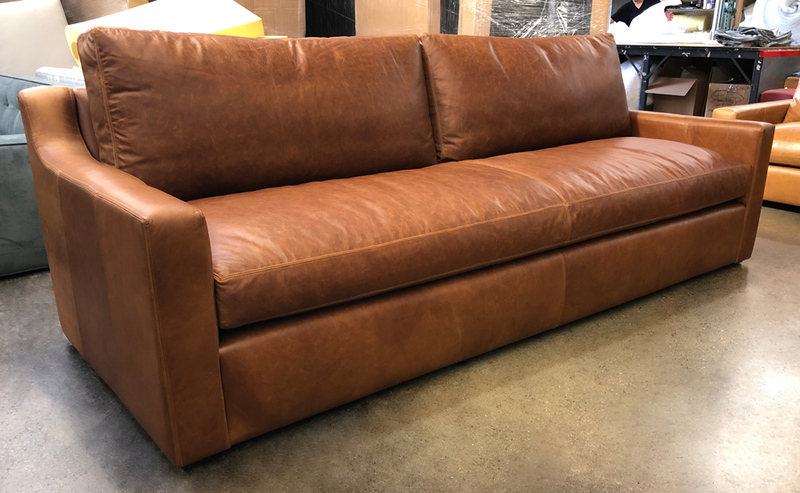 Part of our Julien Collection, this Track Arm, bench cushion Italian Leather Sofa in our Berkshire Chestnut leather just arrived in San Francisco! 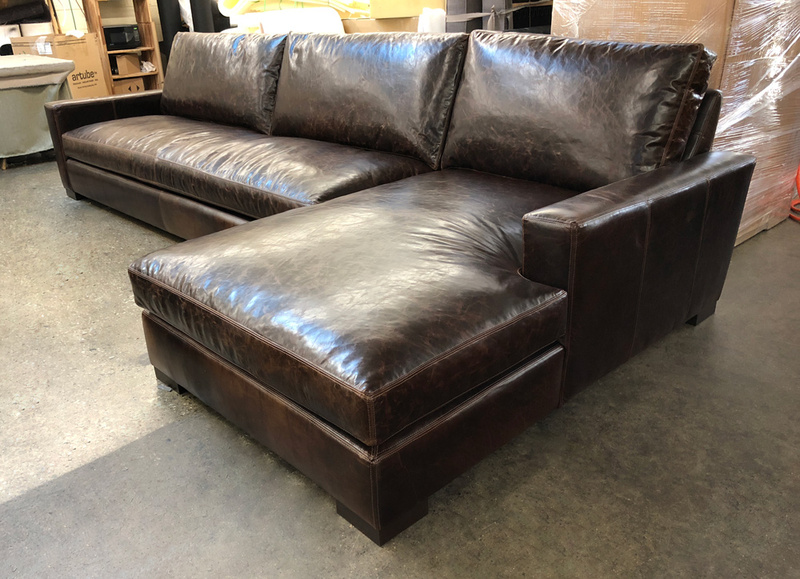 Berkshire Chestnut is a Full Grain Leather made from European hides with celebrated natural scars and markings. 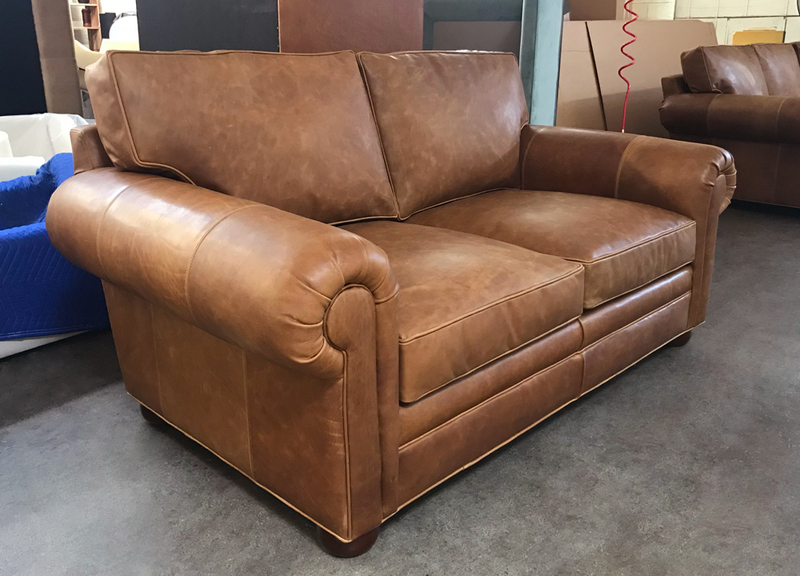 Tanned and finished in Italy with Oil and Soft Waxes, our Berkshire leathers are slightly polished and milled for an authentic, vintage look. View our Julien Collection here! 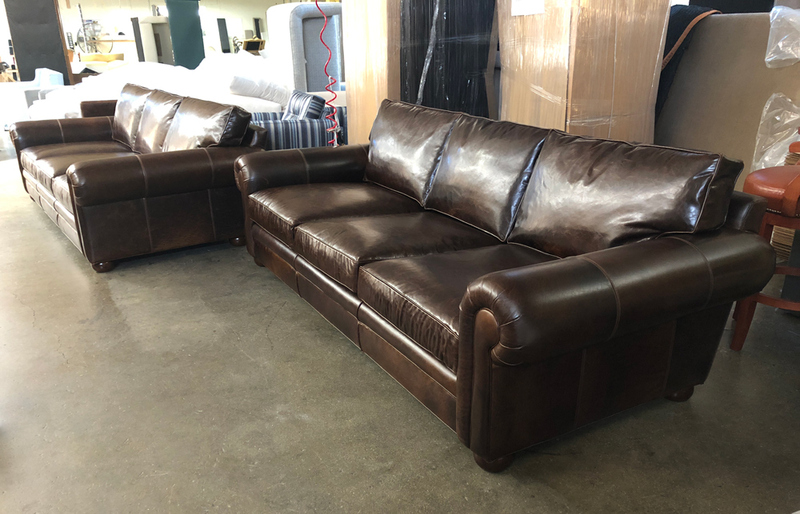 This entry was posted in Custom Leather Order Feed, Julien and tagged 42" Deep, Bench Cushion, Berkshire Chestnut, Italian Berkshire Chestnut, Italian Berkshire Leather, Julien Leather Collection, Julien Leather Sofa, Julien Track Arm Leather Sofa on February 18, 2019 by LeatherGroups. 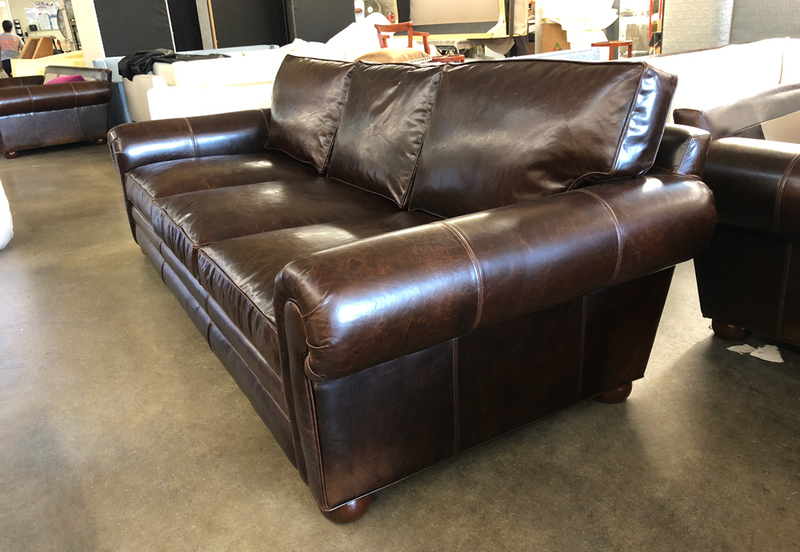 This beautiful and classic looking Langston Leather Furniture set arrived in Pasadena, Maryland not too long ago! 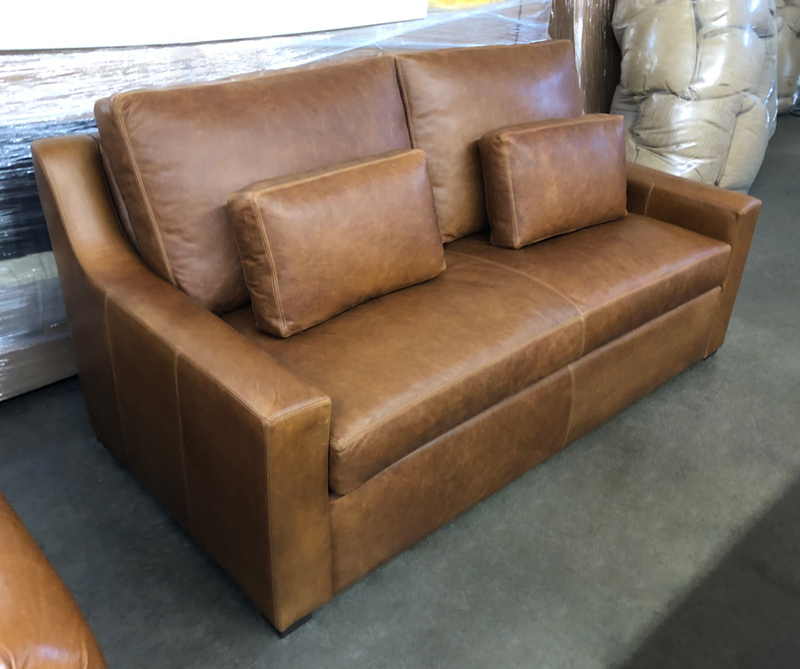 These sofas are in our Italian Brentwood Tan Leather. 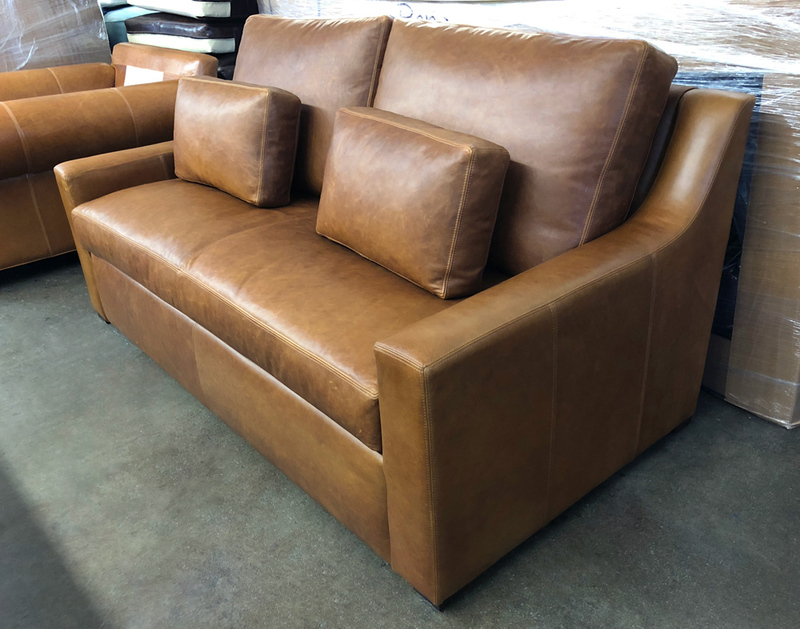 Finished in Italy, this Full Grain, Full Aniline leather distresses and develops patina with loads of character and beautiful color shading variation. View our Langston Collection here! Order your leather samples here! 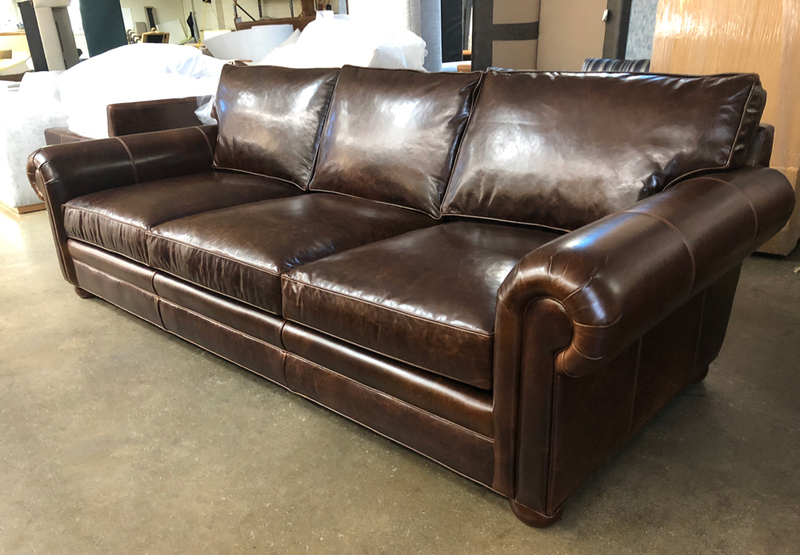 This entry was posted in Custom Leather Order Feed, Langston and tagged 43" Deep, Brentwood Tan, full aniline, full grain leather, Italian Brentwood Leather, Italian Brentwood Tan Leather, Langston, langston collection, langston leather love seat, langston leather sofa on February 18, 2019 by LeatherGroups.